Root Canal Therapy is an unfortunately common procedure that dentists and endodontists perform to remove infection inside a tooth. Root Canals are common when a tooth has an untreated cavity or is damaged by trauma and neglected. Under these circumstances infection can enter the pulp inside of the tooth and fester – creating pain, abscesses and potentially bone loss. Root Canals are often a complex procedure, requiring multiple visits when treated by conventional means. To learn more about the challenges of root canals and Laser + Holistic Dental’s highly effective Laser Assisted Root Canal treatments – please use the links below to navigate. Root Canal Treatments are common in dentistry when decay, periodontal disease or trauma has severely damaged a tooth – leading the dentist to remove the pulp containing the nerve from inside the tooth and then filling the void created during this process. In cosmetic and functional terms, the tooth remains – which may be a positive alternative to an extraction and replacement through some form of prosthesis. However, the end result of a root canal – is essentially keeping a dead tooth in a living being, potentially causing a host of issues. Naturally the body’s immune system can reject the necrotic tooth. When the dentist removes the diseased soft tissue from inside the tooth – all of the blood, lymphatic and nerve supply is removed and is typically replaced with a rubber based filler called gutta percha. This is then sealed with cement to create a barrier against bacteria re-entering the tooth. Because of the loss of blood supply inside the tooth, root filled teeth can become brittle and vulnerable to fracture. The tooth may also turn a darker colour, with many dentists recommending a full coverage crown to prevent fracture and improve aesthetics. The real situation is that root canal procedures are based on an oversimplification of the anatomy found in the intradental pulp system. There is often more than one large pulpal canal but there remains a network of smaller canals travelling in multiple planes – similar to the root system of a tree. Often these microcanal systems hide residual infections that are not addressed during the root canal procedure, even by specialist endodontists using microscopes. 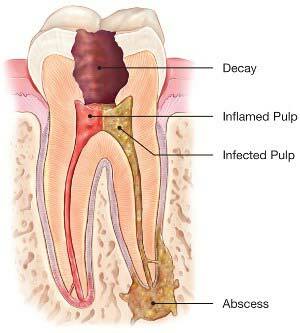 The residual infection stays inside the tooth, before seeding out to other areas of the body via the bloodstream. Conventional endodontics use antibiotic treatments and a steroid based cream, which unfortunately only kills a small representation of the microbial spectrum. The challenge for dental researchers remains – how can residual infections be eliminated without compromising the immune system and retaining tooth structure. This would require a technique that removes all of the pulp system within the tooth and simultaneously kill all pathogenic microorganisms. The intricate internal pulp system, the periodontal ligament and surrounding bone must all be sterilised, with the voids then being filled with an inert, biocompatible material. 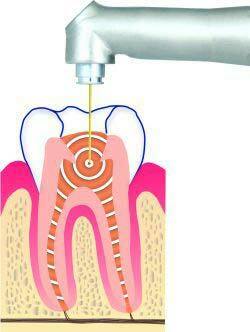 Laser + Holistic Dental uses the revolutionary Twinlight Endodontic Treatment protocol developed by Fotona. Twinlight Endodontic therapy becomes an ideal solution for people who have concerns about the health impacts of conventional root canal therapy yet do not want to have an extraction of their abscessed tooth. This technique utilizes two laser wavelengths making optimum use of the unique laser-tissue interaction characteristics of each wavelength. For example, Er:YAG induces shock waves in the cleaning solutions (PIPS or Photon Induced Photoacoustic Streaming) and Nd:YAG has a superior bactericidal effect. Combined, they can dramatically improve the outcome of laser-assisted root canal treatments providing faster, safer and more effective root canal treatments usually done in a single appointment with the bonus of preserving more tooth structure. The Twinlight method addresses two major disadvantages of conventional root canal therapy: the inability to clean and debride anatomically complex root canal systems and the inability to deeply disinfect dentinal walls. Unlike other laser techniques, PIPS creates an energy transfer at subablative levels – meaning that the antimicrobial action is a photomechanical effect rather than thermal.1 Research has found that PIPS is an extremely effective antimicrobial treatment – with one study publishing results of 100% elimination of Enterococcus faecalis in PIPS root canal treated teeth.2 The additional application of the second laser, Nd:YAG deeply penetrates through hard root surfaces delivering pulsing thermal energy that eliminates bacteria. For further detailed information about eliminating oral infections, root canal treatments and the PIPS technique please call (03) 9078 0387 or contact us today. You may also like to take a moment to browse through our Eliminating Infection page.